A team of technicians from the vehicle graphics firm are applying either a full vehicle wrap or pre-pigmented, cut vinyl graphics to the van models. In total three van models are being liveried. The Vauxhall Movanos, featuring various wheelbase lengths, require full wraps of latex printed 3M IJ180, with 3M 8518 laminate. Meanwhile the Fiat Doblos and Vauxhall Vivaros both have the correct red basecoat, therefore RGVA are only applying 3M 50 series pre-pigmented white and 3M IJ180 laminated and cut graphics to each. All vehicles also have 3M reflective/fluorescent chevrons applied to the rear, to maximise safety. 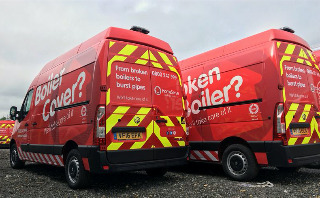 RGVA is working onsite with van conversion companies Mobile Installation Solutions in Doncaster and Quality Industries in Telford to apply the necessary graphics as soon as the new vans are converted for the HomeServe fleet. Both the full wrap and the cut graphics are applied with in a dust-free, temperature-controlled environment between 12 and 18ºC to ensure that all manufacturer guidelines are met and that the 3M Matched Component System warranty is maintained, with each vehicle identical in quality to the last. RGVA has so far applied the new livery 70% of the fleet – with the entire process set to be completed by December. As part of the deal, RGVA provides an aftercare service, helping to create the necessary replacement graphics in case of accident or damage to any vehicle. HomeServe has also turned to RGVA to livery the company’s franchise vans in order to maintain a brand consistency across the board. These vehicles are personally owned by individual franchisees and as such are given the full wrap treatment. RGVA is currently performing around two franchise wraps per month.